In April, Apple scrubbed mention of Barclays and PayPal Credit financing from its regional UK website, including a payment module that allowed customers to apply to either service at checkout. While an explanation for the temporary halt to services has not been provided, Apple is once again offering product financing through both Barclays and PayPal. Further, financing rates and stipulations appear to be identical to those offered prior to the takedown in April. Barclays offers no-interest financing over a 12-month period spending to approved customers spending at least 399 pounds. PayPal Credit financing can be applied to purchases of 99 pounds or more, with customers beholden to a 14.9 percent interest rate on monthly payments of up to 24 months. Interestingly, Apple's product financing webpage only provides information for Barclays, with no mention made of the PayPal option. 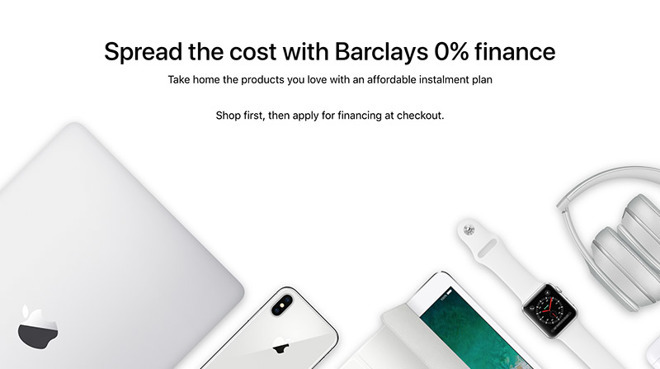 Banner text on the page previously read "Two easy ways to finance your favourite Apple products," but has been updated to "Spread the cost with Barclays 0% finance." Customers can select PayPal Credit at checkout by selecting "Instalments" under the "Payment & Billing Details" section. Apple's educational financing options are still intact and processed through Apple Financial Services. Beyond the UK, Apple is said to be in talks with Goldman Sachs to offer consumer loans through that company's Marcus product, a lending service capable of integrating with existing checkout systems. Likely related to those discussions, reports earlier this month suggest Apple is looking to market an Apple Pay branded card through the investment bank.